THE ORIGINAL DON OF CYBERTRON! The 31st seal of the Roboplastic Apocalypse KRAKKKS apart like the front of your truck as special guest Don Perlin takes you for a spin through the Car Wash of Doom! Mr. Perlin's career as a writer, penciller, inker and cover artist spans so much comic book history you'd need a space bridge to get through all of it! 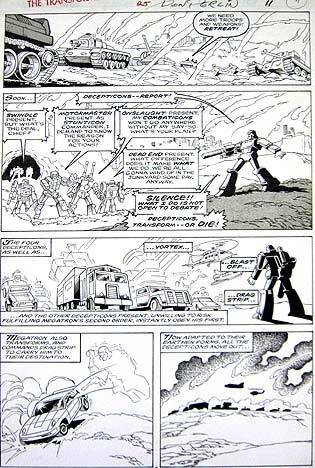 Listen in strange suspense as I tell uncanny tales of my journey to Ancient City Con 2011 to meet a living legend of comics and ask him about his days as the regular penciller on Marvel's Transformers comic from late 1985 through 1987. 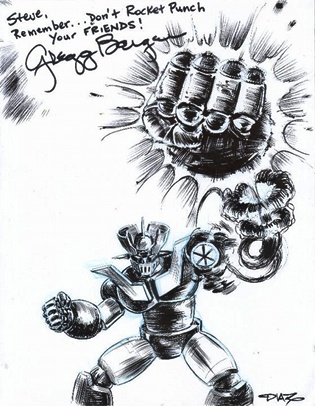 Did being the man drawing the greatest toy robot comic of all time change his life profoundly (and if not, did it at least bag him a cool robot collection)? Did he know Stan Lee was a big fan of Battlechargers? 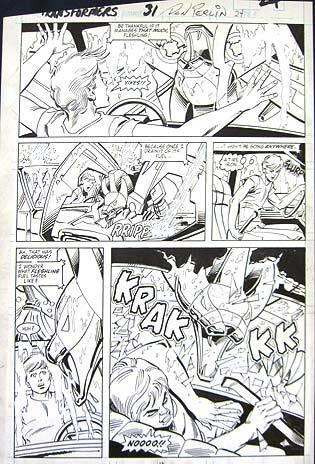 And where can I get some original pages from Buster Witwicky and the Car Wash of Doom? Find out all that and more in this DECEPTICON GRAFFITI CAR WASH TIME MACHINE edition of the Podcastalypse! These are just the two pieces I bought. 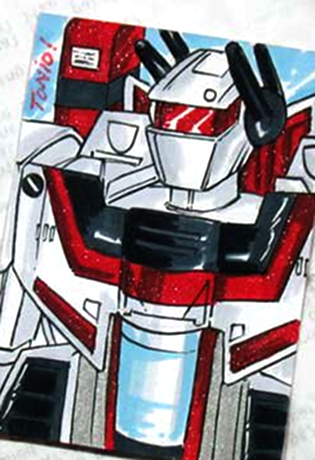 You can see more original Transformer art Mr. Perlin took to the show at my Facebook album of Ancient City Con pictures. DRAW!-With weapons like this, Stormtroopers, cowboys, aliens, Jedis, robots and blank paper all feared Don Perlin at Ancient City Con. Nobody pointed a blaster, lightsaber or Pokeball at him and got away with it. I think some Stormtroopers might have peed themselves. Of course huge thanks goes out to Mr. Perlin and Ancient City Con for making all this possible. 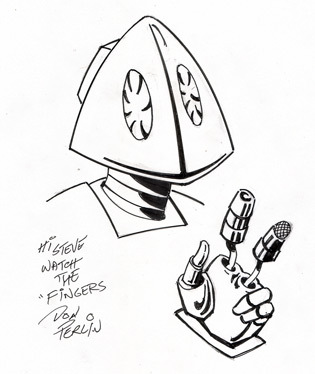 You can find Mr. Perlin on Facebook and check out his gallery at ComicArtFans. 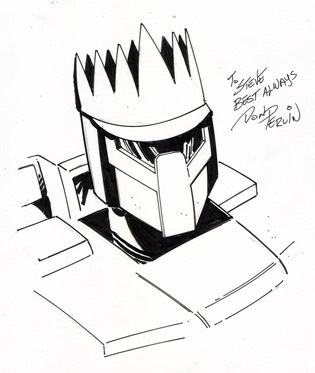 He's still taking commissions and selling original Transformers comic art so drop him a line at DPerlin@Bellsouth.net to score some great art (Transformer or otherwise) or just to say hi. 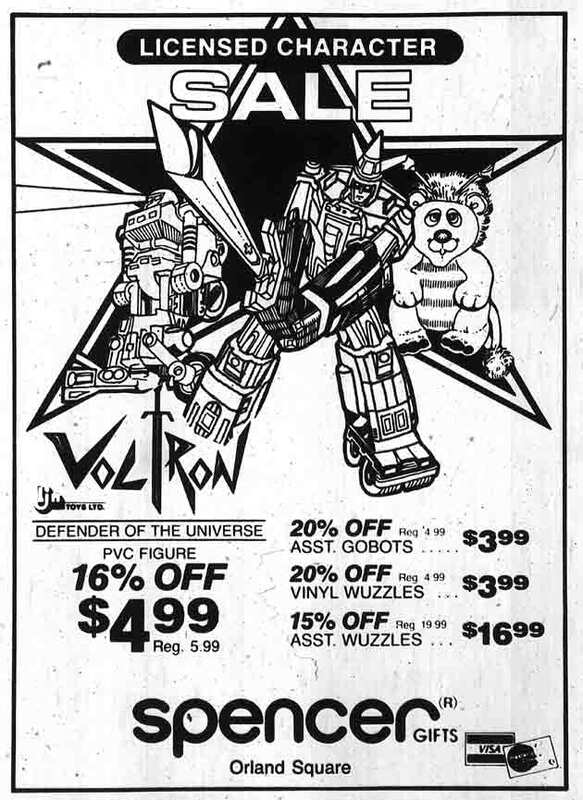 Okay so we've got Super GoBot CyKill, vehicle Voltron and Bumblelion the Wuzzle in this Spencer ad from September 15, 1985. It's kind of a strange combination but weigh what they all have in common versus what makes them different. It's actually pretty deep. I wonder if Spencer was purposely choosing toys that were in their theme of being alternative and underground. If you think about it, Vehicle Voltron wasn't as popular as Lion Voltron, GoBots were running a close second in popularity to Transformers and throwing a Wuzzle in there just makes me think this was Spencer's way of making some complicated metaphor about counterculture dualism and what it means to be two things in one. Or maybe the artist just thought this would be a great setup to a "3 guys walk into a bar" joke. The thirtieth seal of the Roboplastic Apocalypse KRA-KOOMS apart like an iPod being eaten by a talking robot Tyrannosaurus in this Florida Supercon 2011 edition of the Podcastalypse! Thrill to the adventures of the Nostrodomatron as I spend the entire convention wandering around talking to myself about toy robots and pictures of toy robots. Then as if that weren't mind-blowing enough, I talk with special guests Ken Lashley and Gregg Berger, two men who know a lot about cartoons of toy robots! That's pretty much the toy robot subject matter trifecta right there. It's all here and more in this "TRANS-TECHNOLOGICAL CYBERTRONIANS" IS HARDER TO SAY THAN IT LOOKS edition of the podcastalypse! HAY GUYS CHECK OUT my Facebook gallery of Supercon 2011 pictures. Ken Lashley is the man behind Draxhall Jump, which is the company most famous for originating the concepts and designs of the Transformers Transtech line. He's been involved behind the scenes with Hasbro on a number of franchises including Star Wars, G.I Joe and Transformers for over a decade. 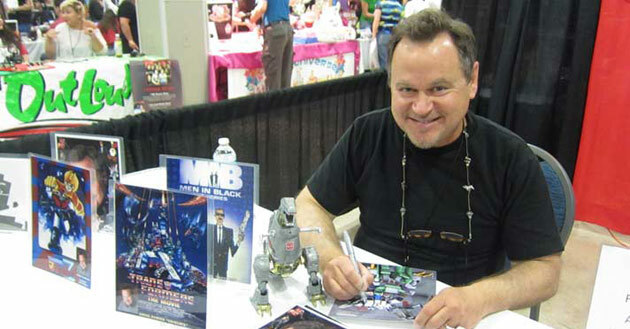 Gregg Berger is of course a renowned professional voice actor famous for many roles including The Transformers' Grimlock the Dinobot. I asked him a few questions about the work he did voicing super robot pilot Tommy Davis in Tranzor-Z, the US released English dub of the legendary Japanese anime Mazinger-Z. 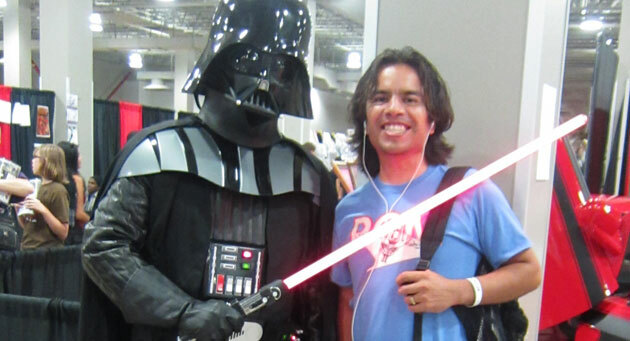 Darth Vader is a fallen Jedi who punched his pregnant wife to death but still knows how to party at Supercon! How much of this Armada toyline poster do you remember? Ken's early concept work on the Driller. Somebody bought the $75 AT-AT! 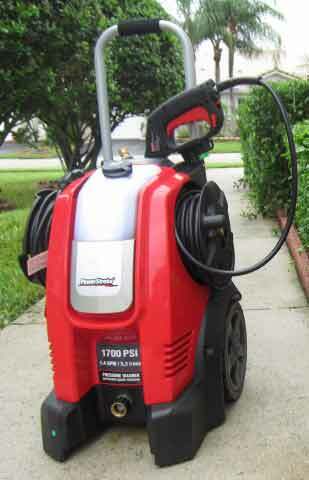 Hey check out my new powerwasher. I named him Battle King Powerwasher Daimos. 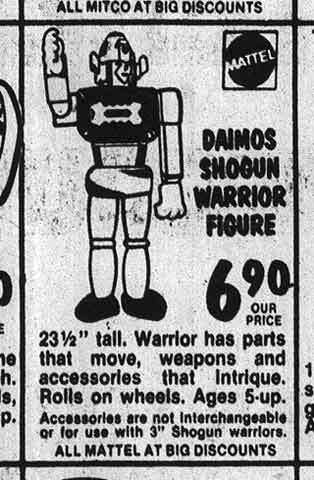 Also check out this Toys R Us ad from December 17, 1980. The Jumbo Daimos for only $6.90! Ouch. I'VE DIED AND GONE TO DEATH STAR! I'm uploading pictures of this weekend's events at Florida Supercon 2011 over on my Facebook page.